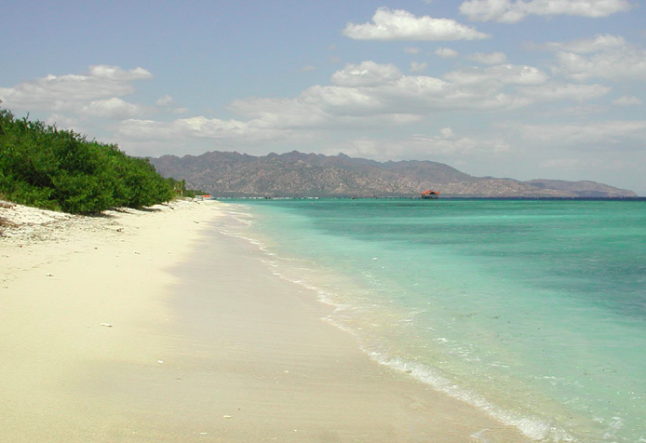 Of the three Gili Islands off the coast of Lombok, Gili Meno is the smallest of the pearls. With a population of just 400, it is also the most peaceful, with a castaway island vibe. Gili Meno is even quieter and more bucolic than Gili Air. The beaches are clean, picture-perfect, and deserted. A coastal path leads all the way around the island, and can be covered at a leisurely pace in 90 minutes. Visitors aren't permitted to rent bicycles here, but you're better off walking anyway, as the beach path is mostly deep sand. Most of the tourist facilities, including the harbor (although this too is seasonal) are on the southern part of the east coast. Here's a short list of highlights on this lovely beach hideaway. Mahamaya Boutique Resort - Luxurious and romantic with beach-front villas, Mahamaya is a hip, eco-friendly resort. The property features an outdoor, fresh water swimming pool, bar/lounge, cafe, restaurant, wifi, AC, and fabulous ocean-front views of Lombok's volcanoes. Mahamaya also provides guests with canoes and snorkel gear. Mao Meno - The owner's vision for Mao Meno is to "provide a space for people to relax, create, and familiarize with their inner landscape." The property is green, lush and spacious, with several large houses and a bungalow for guests. The style is rustic spanish finca meets beach house. Guests can take advantage of a tranquil yoga shala, meditation platform, massages and treatments, and a juice bar/lounge area to hang out and chat. Meno Dream Resort - Located a five-minute walk away from the beach on the southwest of the island's interior, guests rave about the landscaped gardens, tranquility and great food at this small B&B. Meno offers five different types of bungalows, with fresh and hot water, fan-cooled, open-air bathrooms. Family rooms are also available. You can take a cooking class, get a massage or join a yoga class. Many styles and levels are offered, including hatha, hatha flow, yin and vinyasa flow. Mats and props are provided. Mao Meno also has traditional Thai yoga massage, eastern fusion massage, and cranio-sacral therapy. There are several good spots for snorkelling, and gear can be hired at almost any cafe or hotel for about Rp 30,000/day ($3). The beach in front of Good Heart Cafe on the northwest shore is decent and you might just spot turtles in the shallow water. On the west coast, try the area close to the disused, derelict Bounty Resort. The jetty here was sunk and has a healthy reef life. When snorkeling off the east coast, be careful of boat traffic. A gentle stroll around the beach path of Gili Meno is a must-do, as it is arguably the nicest walk anywhere on the three Gili islands. Get started early in the morning or late afternoon to avoid the sun's blazing heat. Treat yourself to a gorgeous sunset over Gili Trawagan on the west coast. Most of the cafes are clustered in the southern half of the east coast, and many are attached to hotels. After you order, sit back and relax: nothing happens in a hurry on Gili Meno, and once you can surrender into the downtempo, you'll enjoy your stay even more. Yaya Warung - (100 m north of the boat landing). If you're a budget traveller, or just don't want to over pay for meh western food, this is the place to eat on Meno. Located on the beach, modestly priced, very popular, with most Indonesian food around 10,000 - 15,000 IDR. Sasak Cafe - beach-front cafe on the west side of the island, with hearty portions of tasty local food, fresh young coconuts, and good tunes. Aroma Cafe - for delicious wood-fired pizzas when you need a break from rice and veg.